Circa 1999. Yes, the fight has been long, but were not giving up. I have the right to know what I am eating. You have the right to know. Really, anyone who is paying hard-earned money for a food or drink, or anything that is going to be ingested and absorbed into the bloodstream, has the right to know. Think about it: you’re at the grocery store, trying to find healthy foods to feed your your family. You pick up a few slices of fresh Atlantic salmon fatty fish like salmon is a good source of Omega-3s, you’ve heard. But what if I told you that soon enough you may be buying Atlantic salmon that has been genetically modified without having a clue that it is, because it’s simply not labeled as such. There is currently no law that requires the labeling of genetically modified foods. And that, my friends, is absolutely absurd. Let me tell you why. What the heck is a genetically modified food? 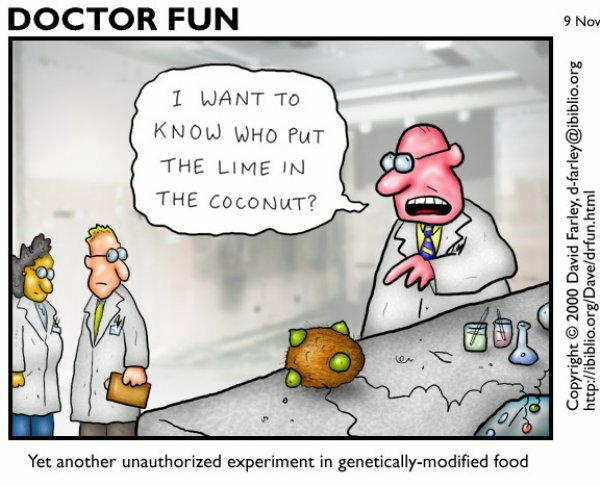 Quite simply (or not), genetically modified foods are plants (or animals, in the case of fish) that have had their genetic makeup tweaked in the lab. Scientists cut-and-splice genes from a particular organism and add it to another plant or animal to give it a particular characteristic, such as resistance against forces of nature such as weeds, pests or drought. (It must escape them that these calamities can be dealt with more effectively without the genetic modification due to biodiversity and the organisms own evolutionary adaptive mechanisms, humph). Another goal is to increase plants yield, or make animals grow faster, for larger profits never mind the possible health and environmental ramifications. Finally, genetic modification may be done with the intent of making the plant or animal look artificially more ripe or fresh even when it really isn’t which I’d consider a deceptive practice of course. Whether or not you think this sounds like quackery, you probably agree that these genetically modified foods should at least be labeled, so that consumers can have a choice. Over 93% of Americans, on both sides of the debate, think that labeling of genetically modified organisms (GMOs), also known as genetically engineered (GE) food or bioengineered food, is a basic right. 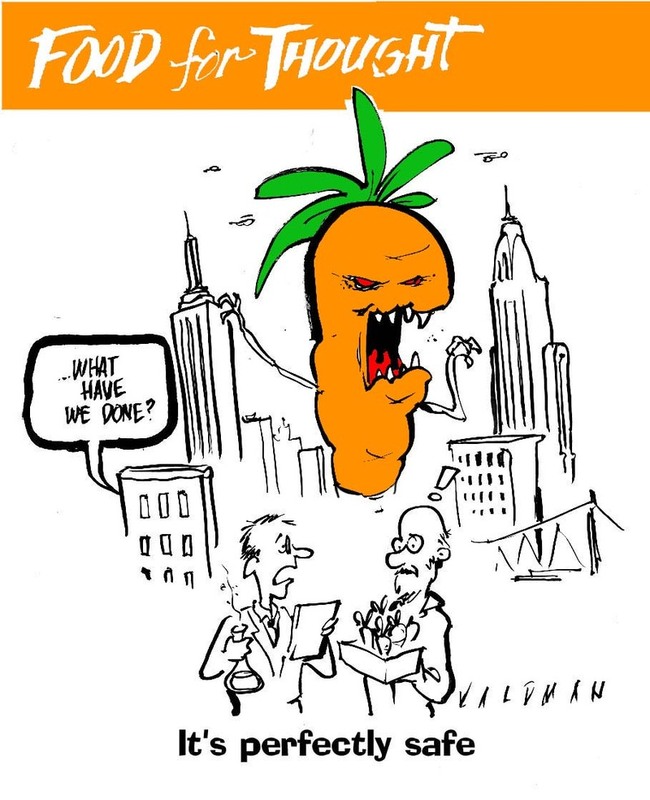 Just Label It is a wonderful campaign aimed at mobilizing the public to demand that GM foods be labeled – sign the petition and share! Are you currently eating genetically modified foods unknowingly? Okay, so you don’t eat farm-raised Atlantic salmon think youre off the hook? Are you still consuming genetically modified food unknowingly? Here’s the simple answer: If you live in America, and if you eat, period, genetically modified foods will find their way to your plate, unless youre extremely vigilant (more on that later). After all, the United States is the largest producer of genetically modified crops in the world. And 10% of all the worlds crops are genetically modified. By the way, many European countries including Austria, Bulgaria, Hungary, France, Germany, Greece, and Luxembourg have put a ban on GMOs. The UK requires labeling as do the 15 European Union nations, Russia, Japan, China, Australia, New Zealand, and many other countries. Even China, whose residents distrust its unsafe food practices, has suspended the commercialization of genetically engineered rice. The United States would do well to follow suit. Do you eat grains? What about other animal products? Do you eat vegetables? About 86% of corn and 93% of soy grown in the United States are genetically modified. These form the bulk of the diet of conventionally-raised animals who spend their entire lives in cramped, filthy feedlots. Oh, you’re a vegan? Think you’re immune to GM foods? Think again. If you eat cereals, granola bars, store-bought veggie burgers, cheese substitutes, or even edamame in whole form, then you’re out of luck, because each of these is almost guaranteed to contain genetically modified ingredients unless it specifies otherwise. And since there is no regulation of what constitutes non-GMO foods, companies aren’t forced to adhere to any rules before claiming that a GM, pesticide-and-preservative doused food is still, somehow, all-natural. Yes, believe me when I say that the all natural label means nothing at all. In fact, not only do I walk away, but I run from a food product when I see the all-natural claim because through my real food journey, I’ve learned that nine times out of ten, it’s the farthest-thing-from-natural, and in fact, the claim that something is all natural increases the probability that it is questionable. Usually, the company claiming it is natural is not one that I would trust with my body and my health. Experts say 60% to 70% of processed foods on U.S. grocery shelves have genetically modified ingredients. 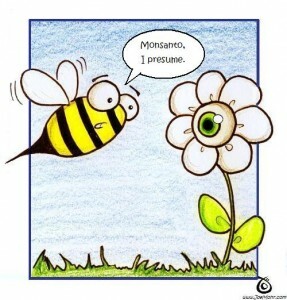 The most common genetically modified foods are soybeans, maize, cotton, and rapeseed oil. That means many foods made in the U.S. containing field corn or high-fructose corn syrup, such as many breakfast cereals, snack foods, and the last soda you drank; foods made with soybeans (including some baby foods); and foods made with cottonseed and canola oils could likely have genetically modified ingredients. These ingredients appear frequently in animal feed as well (WebMD). Oh, but you shop at Whole Foods! Surely, this establishment committed to as many organic foods as possible (53% of products are organic there) cannot be deceiving you and selling you all-natural foods that are contaminated with GMOs. Unfortunately, that is simply not the case. In this interview with Joseph Mercola, DO, Senior VP of Whole Foods admits that some products sold at Whole Foods, even some that bear the all-natural label, are contaminated with GMOs. There are no saints in the corporate game. If you’re a non-discerning Whole Foods consumer, there is a big chance you’re still buying GE (genetically engineered) foods, and paying a premium for it. These above are general guidelines, but it is very difficult, if not impossible, to find an exhaustive list of genetically modified foods, simply because there are no rules mandating that GM foods be identified, singled out, or labeled! But, as mentioned in the link and flowchart above, we do know that there are a number of foods that are most commonly genetically modified and are used ubiquitously in processed and packaged foods and in conventional animal agriculture. *Among each of these crops grown in the U.S., the approximate percentage that is genetically modified is shown in parentheses. For more information, take a look at the FDAs List of Completed Consultations on Bioengineered Foods; it doesn’t tell you which of these is actually at your local supermaket, but at least you have an idea of what the FDA has approved. – Soy (93%): Can you believe that a whopping 82% of edible fats and oils consumed in the U.S. are soy-based? (Healthy Child) Other soy products to watch out for include soy beverages, tofu, meat-substitutes, soy oil, soy flour, lecithin. I personally avoid soy products like the plague, for a number of reasons; this GMO issue is just the cherry on top! If its a packaged product with a list of non-organic ingredients, it will likely have a GM soy by-product. Read ingredient labels scrupulously. – Canola / Rapeseed (93%): Heart-healthy canola oil? Think again. Besides 93% of it being genetically modified, the rapeseed plant, used to make canola oil, is industrially processed and refined. Steer clear of this rancid junk! – Cotton / Cottonseed Oil (93%): Did you know that this cheap industrial oil is used in many packaged salad dressings, baked goods and snack foods? (Healthy Child) Don’t eat anything with cottonseed oil, GM or not. You might want to invest in organic cotton clothes for your baby if you can afford it too. I personally can’t afford all organic cotton clothes for myself, but I think it’s worth it if it’s within the budget. – Corn / Maize (86%): Everyone who knows anything about health has heard of the evil high fructose corn syrup, which has gotten a lot of media attention in recent years. Besides this sugary syrup, corn is pretty much in every other processed food product. The newest kind of GE corn is extra scary, because it is a herbicide-tolerant mutant crop that can survive being sprayed with the infamous herbicide 2,4-D, an Agent Orange ingredient with documented serious human health impacts, from cancer to immunosuppression, reproductive damage, and neurotoxicity (Organic Consumers). Yummy, eh? – Hawaiian papaya (more than 50%): More than 50 percent of papaya from Hawaii is genetically modified to resist a virus. Most U.S. papayas come from Brazil, Mexico, or the Caribbean, however, where there are no GM varieties (Smith). Emily of Butter Believer (who lives in the lovely Hawaii) recently wrote a great post about how to differentiate GM papayas from non-GM varieties. Good thing, because I love the taste of fresh papayas! – Squash and Zucchini (13%): I haven’t found enough information about the prevalence of GM squashes, except that the Crookneck variety seems to be the most popular GM kind out there. Nothing beats the taste of summer squash, in season, from the local farmers market! – Alfalfa: On January 27, the US Department of Agriculture reached a decision on genetically engineered Roundup Ready® alfalfa, having reached the end of the review period for the environmental impact statement (EIS). Out of the three possible options—regulation, partial deregulation, and complete deregulation—the USDA chose the worst possible option: full non-regulated status […] Deregulation is dangerous. Without regulation, GM alfalfa will encroach on non-GM alfalfa, irretrievably contaminating it (ANH). Alfalfa is a big deal because dairy cows graze liberally on it. If there is nothing regulating this high probability of cross-contamination, then the integrity of organic milk can really be in question, with cows grazing on GM alfalfa. And no testing will be done to ensure that it isn’t actually GM alfalfa. If it sounds fishy, its because it is. Again, nothing beats buying dairy locally. – Honey: Apparently, Some Canadian honey comes from bees collecting nectar from GM canola plants. This has shut down exports of Canadian honey to Europe (Disabled). Yes, the EU is smart enough to ban GE-contaminated honey It’s best to buy local honey, from a farm you trust. – Potatoes (some of the GM varieties include Atlantic, Russett Burbank, Russet Norkatah, and Shepody): GM or not, it’s probably wise to buy only organic potatoes if you can, because they’re one of the most heavily sprayed crops. – Dairy from cows injected with rBGH: [As of 2002], about 22 percent of cows in the U.S. are injected with recombinant (genetically modified) bovine growth hormone (rbGH). Dairies generally collect their milk from many sources. In the U.S., if a dairy product is not labeled organic, non-GMO, or made without hormones, it is likely that a portion of the product came from cows that were injected with rbGH (Smith). On a similarly disturbing note, scientists have recently been able to engineer cows milk to make it more similar to human breast milk, through genetic modification. It might be coming to a supermarket near you in the next few years, so beware. I drink my pure, unadulterated cows milk raw from a local farmer I trust in order to avoid all this nonsense. – Atlantic Salmon (made by US-based company AquaBounty): pending FDA approval. Just don’t buy farmed fish, especially if imported from another country, capisce? Well, that is if you want to avoid antibiotics, toxic chemicals and artificial fish feed and dyes! – Enzymes, Additives & Sweeteners: Genetically modified bacteria and fungi are used in the production of enzymes, vitamins, food additives, flavorings and processing agents in thousands of foods on the grocery shelves as well as health supplements. Aspartame, the diet sweetener, is a product of genetic engineering (Smith). And by the way, theres a new artificial sweetener in town called Neotame, also brought to you by Monsanto. Told ya; its probably a good idea to avoid any and all packaged foods! – Synthetic Vitamins: Vitamin C (ascorbic acid) is often made from corn, vitamin E is usually made from soy. Vitamins A, B2, B6, and B12 may be derived from GMOs as well as vitamin D and vitamin K may have carriers derived from GM corn sources, such as starch, glucose, and maltodextrin (Disabled). Another reason to ditch the Centrum! What’s the big deal with GM foods anyway? 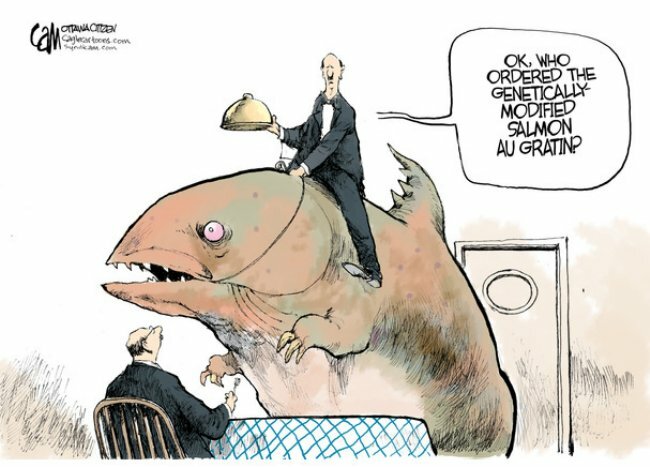 What’s wrong with genetically engineered salmon, you ask? Oh, well, we really don’t know yet. We do know that its manipulated enough to cause it to grow three times faster than regular salmon, that its more aggressive and much larger than normal salmon, and yet is weaker and has a higher mortality rate than its non-GM counterpart. Yikes. Its also farm raised, and since it has no access to nourishing natural food in the form of living plankton and krill, farmed fish are given artificial feed like genetically modified corn, soy and synthetic supplements, a big dose of antibiotics to prevent disease (I wonder if they ever heard that this may cause antibiotic-resistance? ), and are artificially dyed orange-red to mask their nutrient-deficient white color (the bright red color is naturally present in wild fish because they eat plankton). All this, and there is a large chance that many of these Franken-fish can escape and contaminate fish in the wild. Appetizing, eh? Still think this antibiotic-filled, artificially-colored, genetically-modified fish can be in any way good for health? I think not. Salmon aside, you might think it odd that the FDA and USDA completely gloss over studies like these, which have found genetically modified foods to be damaging to the organs of mammals and causing weight gain, even though the longest of the trials only studied the effect over a 90-day period and already found it damaging! Also, despite claims by big firms like Monsanto that the GM properties would be destroyed in the gut, a landmark study found 93 per cent of blood samples taken from pregnant women and 80 per cent from umbilical cords tested positive for traces of the chemicals (Daily Mail). Hmm, would you like to wait to find out if over-consumption of GE foods can hurt you or your baby? Kill some kidney cells and ruin your digestive functions in the process; no real harm done, right? Wouldn’t it be wiser to practice a more precautionary attitude when it comes to novelties in science and health especially because there are such studies that already shed light on possible dangers? Plus, what if I told you that the genetically modified foods were starting to be ineffective in their sole job to kill weeds and pests? And what if I told you that the pests and weeds are becoming resistant to the innovation, and that more manipulation via genetic engineering is required to keep these crops alive, and to keep the farmers who depend on them employed? How would you feel about that? 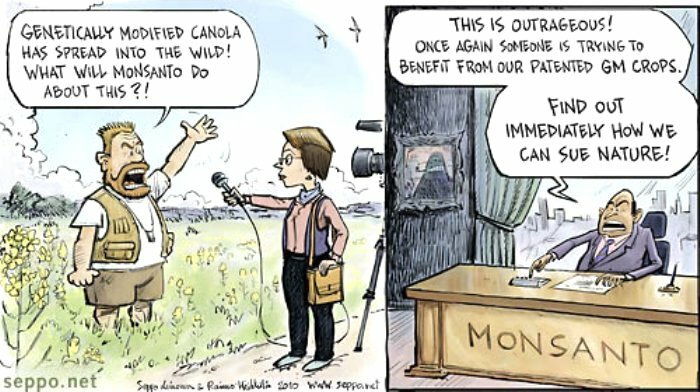 The truth of the matter is that large biotechnology firms like Monsanto, which develop these GM foods, will never admit that their product is fundamentally flawed, has a negative impact on health and environment, and strips traditional farmers the world over of their natural farming methods needlessly, or that their practices are irreversibly altering our ecosystem. The companies will not admit it; but the companies cannot be expected to self-regulate. That’s what the government is for to protect the rights of the people to be informed to make their own decisions, and to monitor these companies practices to ensure that they are lawful. If these companies would like to mess with some part of nature, they need to maintain that their activities are not destroying other parts of nature. And if they are destroying more than allotted belongings, then theyre responsible! But guess what? The exact opposite is happening. Monsanto and other biotechnology giants own GM seeds; they have their patents registered with the government. So, farmers whose organic crops have been contaminated by GM seeds (due to wind or cross-pollination; not because the farmers have planted the GM seeds themselves) end up being harassed and sued by Monsanto for patent infringement the very company that is ruining their crops and livelihood! Oh, the irony. And when the farmers recently tried to band together to sue the corporate behemoth, they lost the case for no good reason. Money talks, I tell you! And if we don’t stand up as concerned citizens and demand transparency, pretty soon our children can be susceptible to indoctrination and brainwashing by these corporate giants. 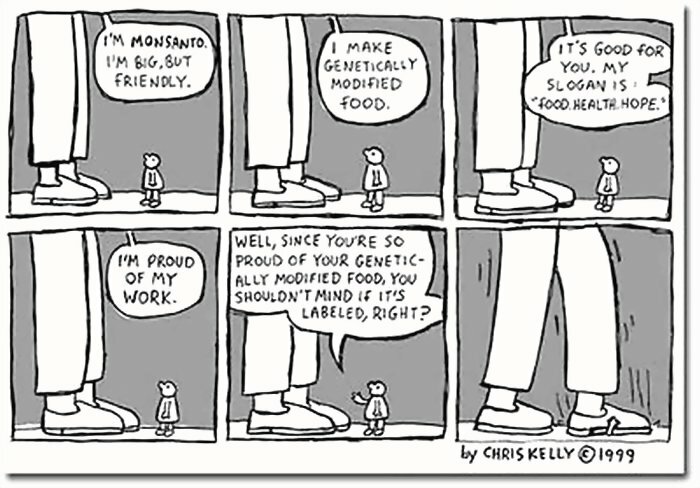 You’d think that enough testing takes place before these genetically modified foods hit the market, but the reality is that corporate interests often supersede public health; so, foods, medications, vaccinations, substances anything manufactured, often gets approved in a shoddy, unscientific way, without enough testing to deem them safe for humans. Within the past few decades, opinions have been reversed after people have been burned using things like asbestos, painkillers, and even organic baby foods and products, as a result of hasty approval and poor regulations. I wonder will GM foods be next? Down the road, after humans use these medications and buy this food, without knowledge of their side effects, a lot of bad things can start to happen. People may die. They may get sick. Babies can be born with more birth defects and complications. We are then forced to face the reality that maybe this so-called promising invention isn’t so promising after all, but only when its too late. And the recommendations to consume these things is often rescinded, but often after the damage has been done to a large segment of the population. And if precedent is any indicator, the companies responsible, with their powerful attorneys and billions invested in marketing, slip away with only a couple of million of dollars worth of lawsuits chump change in their book. The real victims? People who fell for the scam, and have suffered needlessly. If you want to avoid GMOs in your food, you have to be vigilant. As mentioned earlier, buy only certified organic foods, limit your purchases of anything packaged, eliminate processed foods and shop at your local farmers market or join a CSA that sources from local farms. There are a number of labels and food guides available for free to help you navigate the isles at your grocery store. 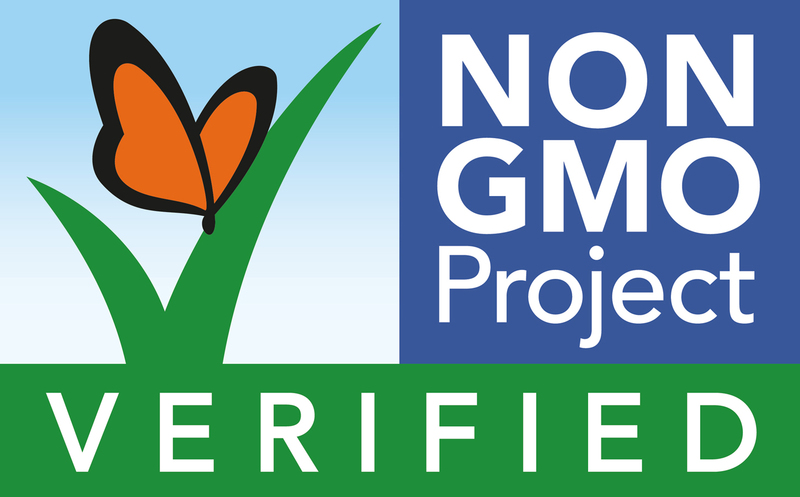 Look for foods with the Non-GMO Project certification label (to the left) and/or the USDA organic certification label. There’s a neat Non-GMO shopping guide by the IRT. There is The Center for Food Safety to help you identify which brand(s) have GMO-free ingredients. Dr. Joseph Mercola of the health news site Mercola.com frequently shares posts on GMOs, their dangers, and how to avoid them. A number of real food bloggers have also put together lists, including Jenny of Nourished Kitchen who has a handy-dandy list of brand names that are GMO free, and Raine of Agriculture Society who busts the top 10 myths about GMOs in this post. Any other resources that you’re aware of? Share in the comments, and I’ll update the article. – Raise awareness: Share this post and similar posts with friends and family. Share this article on Facebook. Pin the cartoons and infographic on Pinterest. Tweet about the petitions you have signed all in an effort to help inform more of your social circle that they can demand that GM foods are labeled, and why it makes a lot of sense to avoid Frankenfoods in the first place. – Vote with our dollars: It’s no secret that money talks. As demand for organic, non-GMO foods increases, supply will increase and industry will follow. Dont buy any processed food products, diligently read ingredient labels of any packaged foods that you do buy, and look for the certified organic and the non-GMO project labels on foods before you purchase. – Buy local: If you buy from small local farms either directly or through buying clubs, farmers markets or CSAs, you can easily verify the source of your foods, visit the farms anytime and ask your farmers the hard questions. As a bonus, you keep the money circulating in your local economy, and you promote sustainability in agricultural practices and carbon emissions while you’re at it! Through it all, don’t lose hope. Every attempt to get the word out matters a lot. Don’t underestimate your power as a consumer to effect real change. Meal Prep For Diabetics Or Those Trying to Lose Weight.